Fish and chips can be a delicious and healthy meal, and doesn't have to be something that's strictly off limits when you are trying to keep yourself and your family healthy. Fish is an excellent source of protein – and it’s also low in fat. 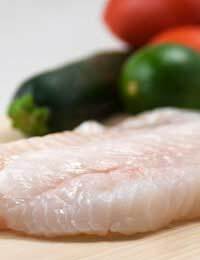 We should all be eating more fish, as it’s a lean, low calorie and highly nutritious food, whether you decide to opt for the white fish for its high vitamin and mineral content, especially selenium and iodine, or go one step further and make your super healthy fish and chip meal out of oily fish. Experts say that we should up our intake of oily fish such as salmon, herring and trout, because of all the essential fats (omega three) they contain. The humble chip doesn’t have to be a greasy lump of soggy overcooked potato, or an over salted French fry from a fast food restaurant. Cooked properly and in a healthy way, chips can be a great source of carbohydrate, which we all need – and potatoes also contain a healthy dose of vitamin C – a vitamin that the body can’t produce by itself so we have to keep our intake up! To create a mouth watering but healthy fish and chip supper, try this recipe. Cut the potatoes into 1.5 cm wide chips, and add to a pan of boiling water. Cover and cook until the chips are just tender, then drain.Beat the egg, milk and seasoning together in a shallow dish, pat the fish dry and dip it in the mixture, and then in the breadcrumbs. Place on a baking tray and spray with the low fat cooking spray. Add the oil and the chips to a large bowl and coat them well. Put the chips onto a baking tray, season well and cook for 20 minutes at the top of the oven. Cook the fish for fifteen minutes. Serve the fish and chips with a side salad, or some peas. Alternatively, you could make your own mushy peas with frozen peas, Greek yoghurt and lemon juice. If you prefer, you can make a similar and just as healthy dish with salmon fillets. Make the chips as per the previous recipe, and substitute the white fish fillets for four large salmon steaks or fillets, around 150g each. For the salmon recipe, you could change the ingredients slightly, adding dried mixed herbs to the bread crumbs to give the salmon an extra zing! Serve this dish with a side salad and a squeeze of lemon juice to bring out the flavour of the salmon too.